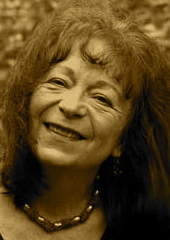 A Year of Being Here: Linda Back McKay: "On the Meaning of"
the sound of your mother’s voice. without and gives you a heron instead. shaped like hands in prayer. Life is shape, sight, sound, bone. you and you almost never feel it. You push your way from phase to phase. You are a horse with blinders. like mirrors, in your direction. "On the Meaning of," by Linda Back McKay, from The Next Best Thing: Poems. © Nodin Press, 2011. 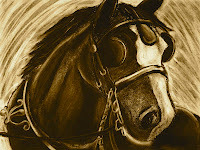 Image credit: "Horse with Blinders," charcoal on paper, by Tony Lawton (originally black and white). I have been given a heron. Thank you.